In Gartner's perennial game of musical chairs, otherwise known as its annual magic quadrant exercise, the latest object storage square ushers three in and one out. The Magic Quadrant for Distributed File Systems and Object Storage 2017 positions distributed file system and object storage vendors in a 2D space with "completeness of vision" and "ability to execute" being the two axes. There are four boxes in the resulting graphic, labelled "Niche Players" and "Visionaries" on the lower part of the chart and "Challengers" and "Leaders" on the upper part. Here's the October 2017 edition of this MQ, followed by last year's version. The main things to notice are that the Leaders and Challengers are unchanged except slight in-box positional moves. HDS becomes Hitachi Vantara due to Hitachi's business group reorganisation and renaming. 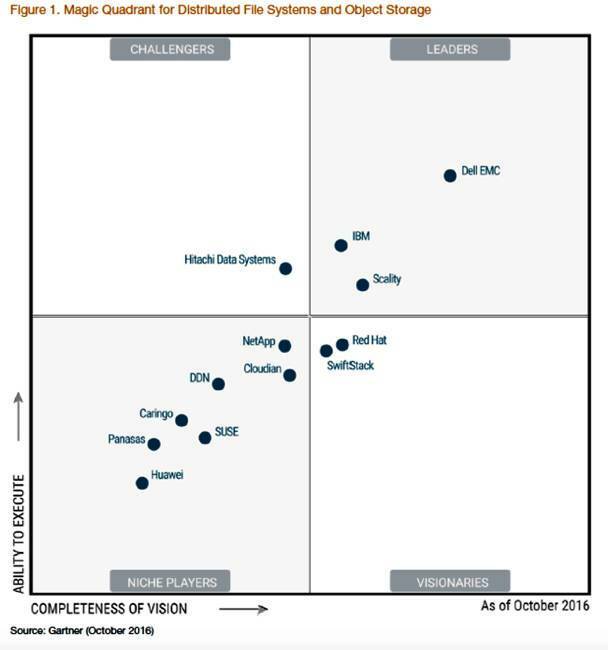 Qumulo enters the MQ as a Visionary, and HGST and StorageCraft (Exablox) enter as Niche players. Panasas has exited the Niche Player box and the MQ in its entirety. What does Gartner say about these comings and goings? The Gartnerites think that, by 2021, more than 80 per cent of enterprise data will be stored in scale-out storage systems in enterprise and cloud data centres, up from 30 per cent today. This is good news for the startups and newcomers to this space.